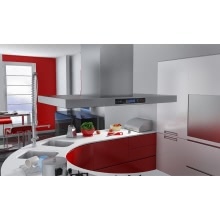 Our high quality island mount range hood with LCD display will guarantee you a clean and odour-free kitchen. Cooking in a clean and odour-free environment with our extra powerful island mount range hood! Our high quality LCD hood is designed for optimum operation. The powerful wind tunnel will absorb vapour and exhaust in a fraction of time. It also features sensitive touch switch panel with LCD display, 4 LED lights for illumination, and the 3 speed touch control switch panel allows you to select the airflow speed. Its contemporary European design blends in any home decor easily. The low-noise operation also makes it a perfect addition to your kitchen. Delivery includes 1 range hood, 3 grease filter s, and 1 exhaust hose.